Download "Assistive Technology: A Framework for Consideration and Assessment"
7 Assistive Technology Framework, (2008) 5 Multiple Means of Recognition, to give learners various ways of acquiring information and knowledge. Multiple Means of Expression, to provide learners alternatives for demonstrating what they know. Multiple Means of Engagement, to tap into learners interests, offer appropriate challenges, and increase motivation. The provision of flexibility does not indicate that curriculum expectations should be lowered. Criteria can be maintained when careful planning for access is identified during lesson development. Technology and digital media are important in UDL because they can offer teachers the tools for providing varied materials and resources. For example, in using a computer, students can manipulate the style and size of text, change the background color, have text read aloud, add sound, hyperlink to resources, output to a variety of peripherals, such as a Braille printer, and vary input through options such as alternate keyboards, voice recognition, or a switch. When lessons have been prepared through a single type of classroom media such as the traditional paper and pencil worksheet, textbooks, and chalkboards, it becomes difficult to make those materials accessible to learners who cannot see them, use their hands to manipulate them, or decode and comprehend the information written on them. These static materials, although very beneficial to many students in the learning environment, provide barriers for learning for some individuals with disabilities. Accessible Instructional Materials For many students with disabilities, the limitations of print technology raise barriers to access, and therefore to learning. Following the passage of IDEA in 1997, it became essential that all students have access to the general curriculum, and thus to the print material of which it is composed. Students who cannot see the words or images on a page, cannot hold a book or turn its pages, cannot decode the text, or cannot comprehend the syntax that supports the written word may each experience different challenges, and they may each require different supports to extract meaning from information that is "book bound." For each of them, however, there is a common barrier - the centuries-old fixed format of the printed book. 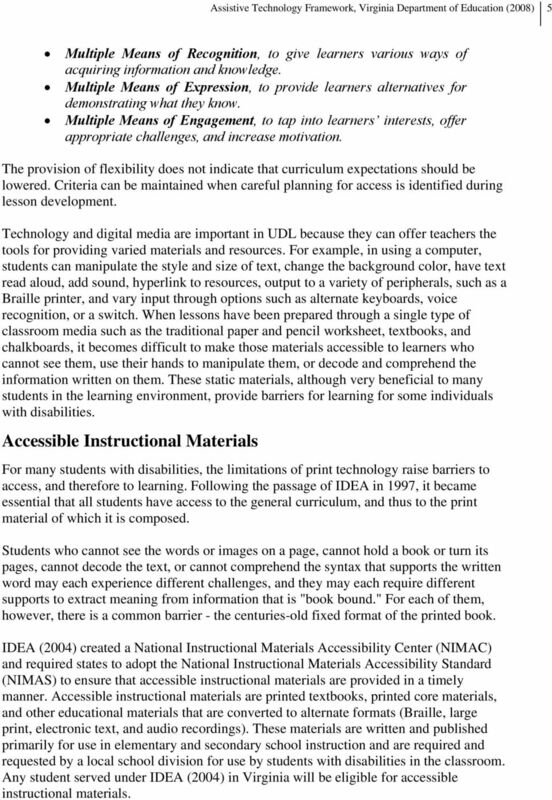 IDEA (2004) created a National Instructional Materials Accessibility Center (NIMAC) and required states to adopt the National Instructional Materials Accessibility Standard (NIMAS) to ensure that accessible instructional materials are provided in a timely manner. Accessible instructional materials are printed textbooks, printed core materials, and other educational materials that are converted to alternate formats (Braille, large print, electronic text, and audio recordings). These materials are written and published primarily for use in elementary and secondary school instruction and are required and requested by a local school division for use by students with disabilities in the classroom. 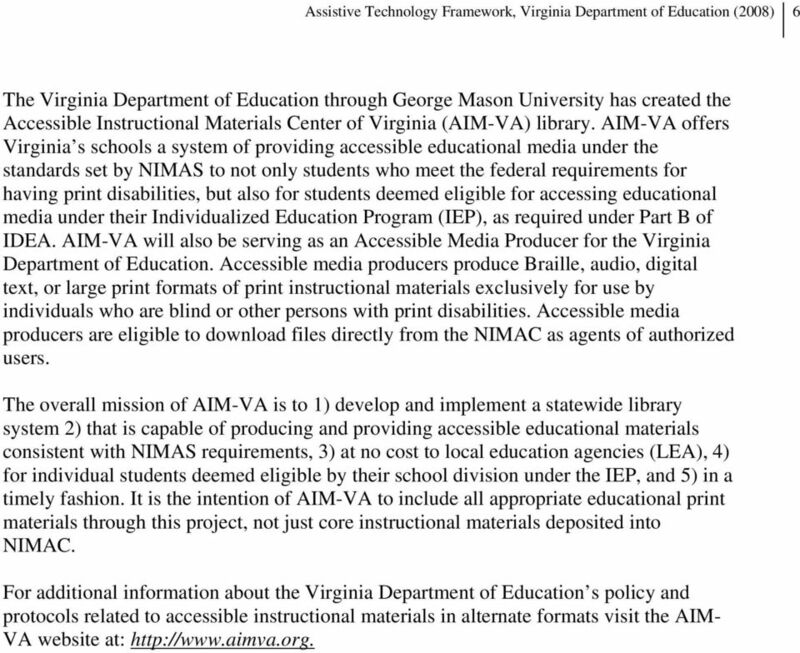 Any student served under IDEA (2004) in Virginia will be eligible for accessible instructional materials. 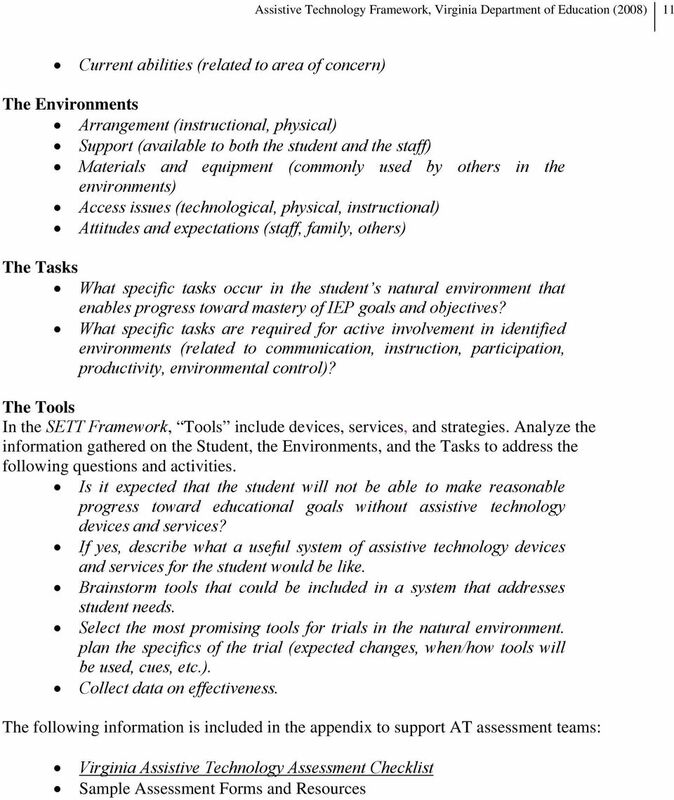 10 Assistive Technology Framework, (2008) 8 ASSISTIVE TECHNOLOGY ASSESSMENT Credit is given to the Wisconsin Assistive Technology Initiative for information included in the following section. IEP teams may decide that further investigation or assessment is needed in order to make an informed decision about whether a student requires AT in order to be successful in his/her customary environment. Consideration and assessment differ in terms of depth and duration. Consideration is a short discussion that takes place during the IEP meeting to determine if current strategies are adequate or not. Assessment takes an in-depth look at the student s abilities and difficulties and the demands of the environment and tasks. Assessment also includes the acquisition of new information (Reed & Lahm, 2004). 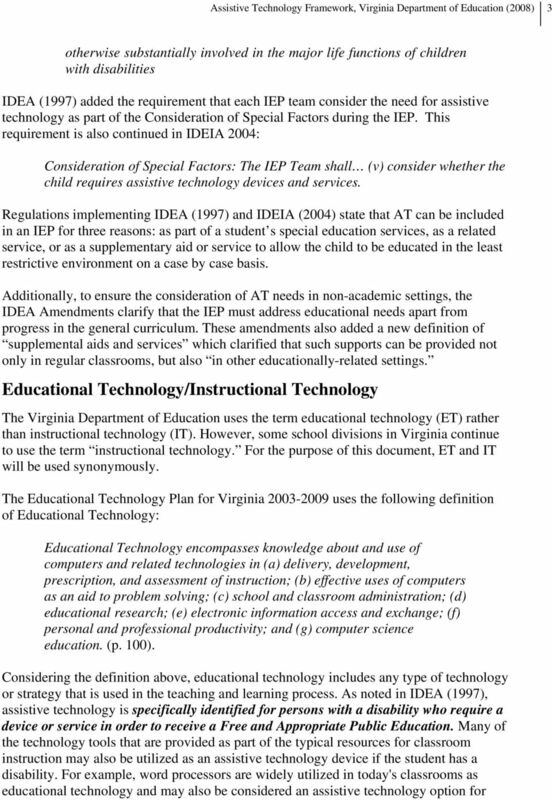 IDEA (1997) requires that school divisions provide assistive technology evaluation. The Federal Register (July 10, 1993) distinguishes between assessment and evaluation in the following way: Evaluation: A group of activities conducted to determine a child s eligibility for special education. Assessment: A group of activities conducted to determine a child s specific needs. 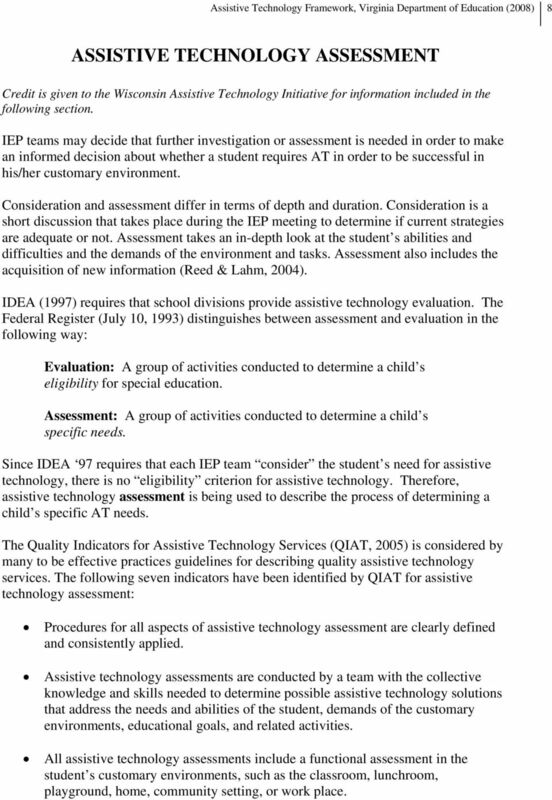 Since IDEA 97 requires that each IEP team consider the student s need for assistive technology, there is no eligibility criterion for assistive technology. Therefore, assistive technology assessment is being used to describe the process of determining a child s specific AT needs. The Quality Indicators for Assistive Technology Services (QIAT, 2005) is considered by many to be effective practices guidelines for describing quality assistive technology services. The following seven indicators have been identified by QIAT for assistive technology assessment: Procedures for all aspects of assistive technology assessment are clearly defined and consistently applied. Assistive technology assessments are conducted by a team with the collective knowledge and skills needed to determine possible assistive technology solutions that address the needs and abilities of the student, demands of the customary environments, educational goals, and related activities. All assistive technology assessments include a functional assessment in the student s customary environments, such as the classroom, lunchroom, playground, home, community setting, or work place. 11 Assistive Technology Framework, (2008) 9 Assistive technology assessments, including needed trials, are completed within reasonable time lines. 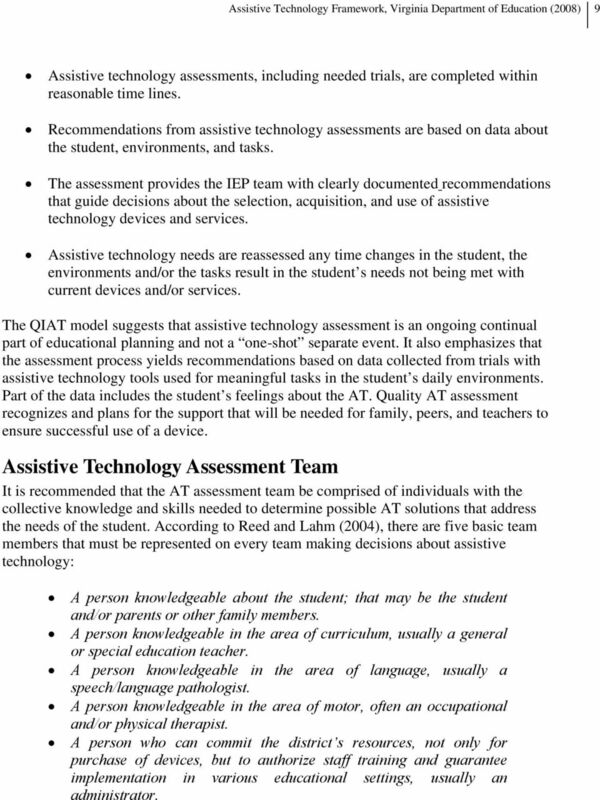 Recommendations from assistive technology assessments are based on data about the student, environments, and tasks. 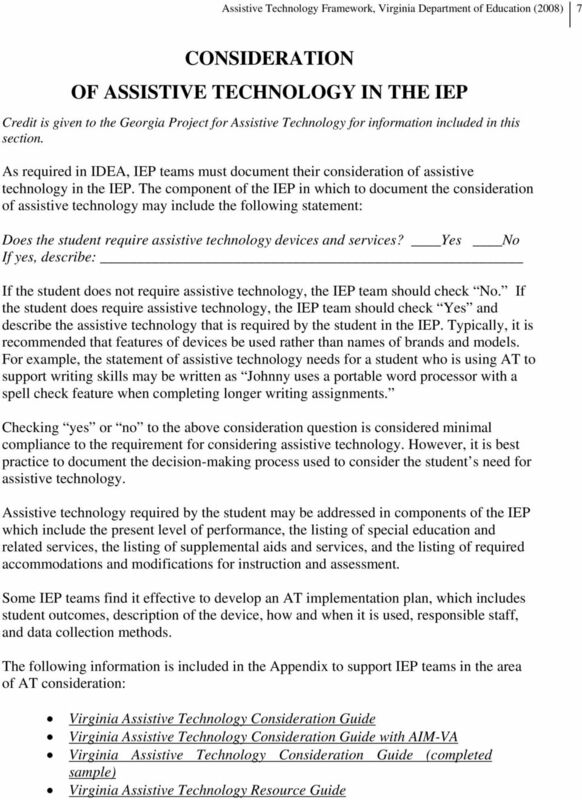 The assessment provides the IEP team with clearly documented recommendations that guide decisions about the selection, acquisition, and use of assistive technology devices and services. Assistive technology needs are reassessed any time changes in the student, the environments and/or the tasks result in the student s needs not being met with current devices and/or services. The QIAT model suggests that assistive technology assessment is an ongoing continual part of educational planning and not a one-shot separate event. It also emphasizes that the assessment process yields recommendations based on data collected from trials with assistive technology tools used for meaningful tasks in the student s daily environments. Part of the data includes the student s feelings about the AT. Quality AT assessment recognizes and plans for the support that will be needed for family, peers, and teachers to ensure successful use of a device. 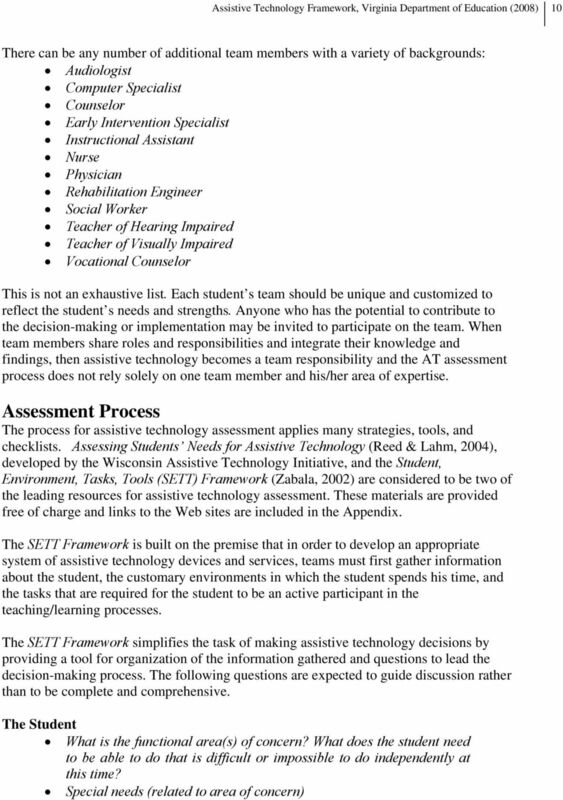 Assistive Technology Assessment Team It is recommended that the AT assessment team be comprised of individuals with the collective knowledge and skills needed to determine possible AT solutions that address the needs of the student. According to Reed and Lahm (2004), there are five basic team members that must be represented on every team making decisions about assistive technology: A person knowledgeable about the student; that may be the student and/or parents or other family members. A person knowledgeable in the area of curriculum, usually a general or special education teacher. A person knowledgeable in the area of language, usually a speech/language pathologist. A person knowledgeable in the area of motor, often an occupational and/or physical therapist. A person who can commit the district s resources, not only for purchase of devices, but to authorize staff training and guarantee implementation in various educational settings, usually an administrator. 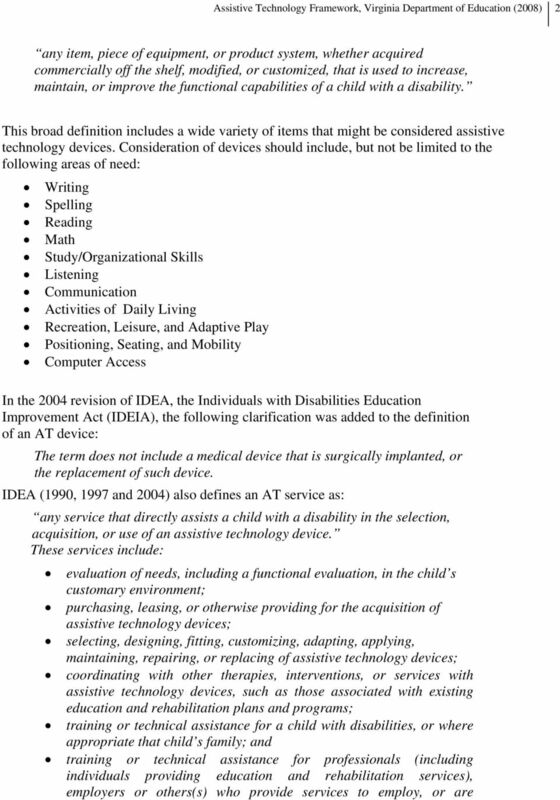 14 Assistive Technology Framework, (2008) 12 References Assistive Technology Act, Pub. L. No , 2432 (iv) (2) (a) (1) (1998). CAST. (2008). 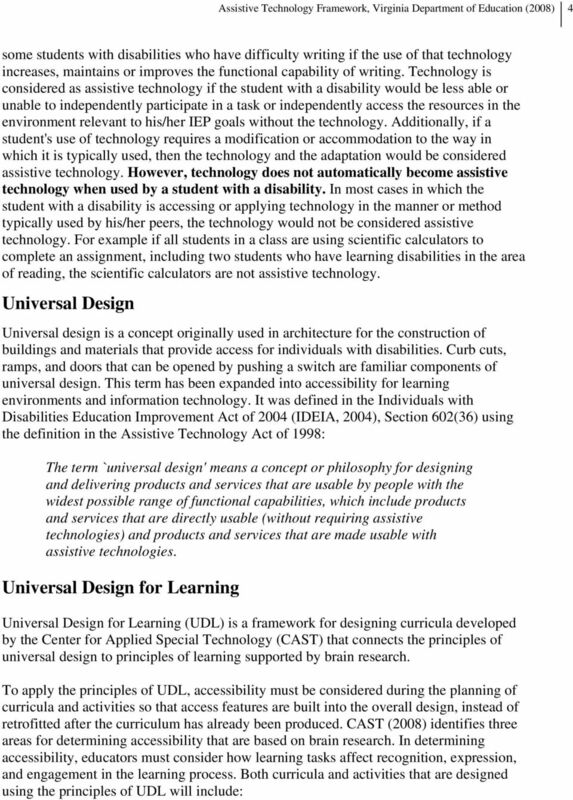 Universal design for learning guidelines version 1.0. Wakefield, MA: Author. Retrieved April 10, 2008, from Georgia Project for Assistive Technology. (2007). Considering assistive technology in the IEP. Forest Park, GA: Georgia Project for Assistive Technology. 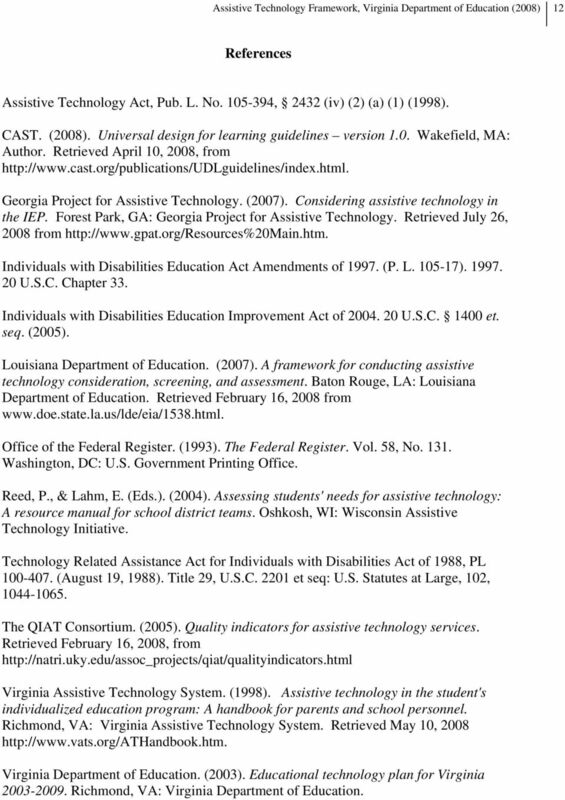 Retrieved July 26, 2008 from Individuals with Disabilities Education Act Amendments of (P. L ) U.S.C. Chapter 33. Individuals with Disabilities Education Improvement Act of U.S.C et. seq. (2005). Louisiana Department of Education. (2007). 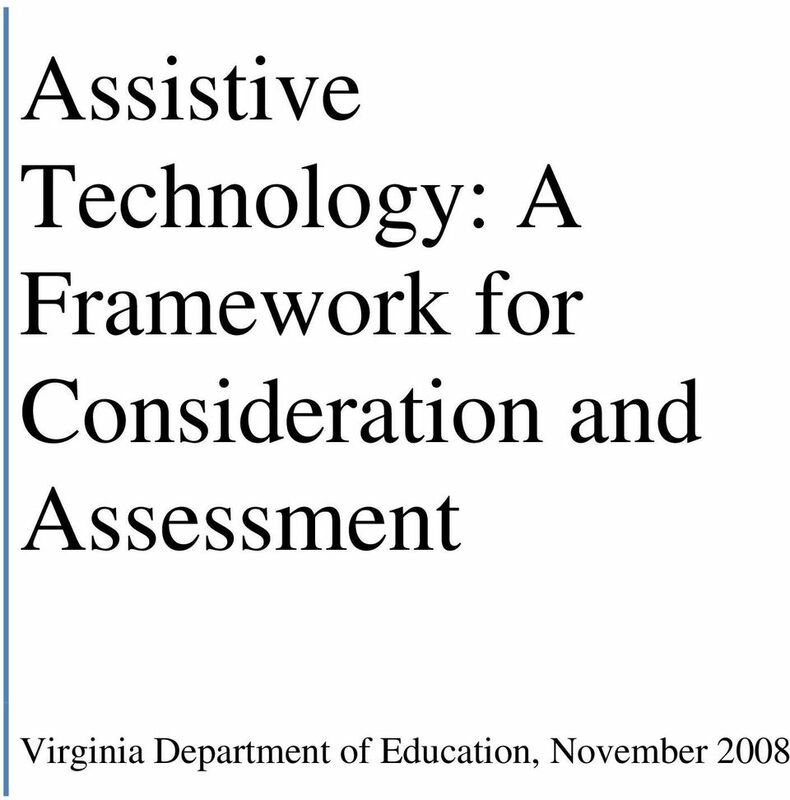 A framework for conducting assistive technology consideration, screening, and assessment. Baton Rouge, LA: Louisiana Department of Education. Retrieved February 16, 2008 from Office of the Federal Register. (1993). The Federal Register. Vol. 58, No Washington, DC: U.S. Government Printing Office. Reed, P., & Lahm, E. (Eds.). (2004). Assessing students' needs for assistive technology: A resource manual for school district teams. Oshkosh, WI: Wisconsin Assistive Technology Initiative. Technology Related Assistance Act for Individuals with Disabilities Act of 1988, PL (August 19, 1988). Title 29, U.S.C et seq: U.S. Statutes at Large, 102, The QIAT Consortium. (2005). Quality indicators for assistive technology services. Retrieved February 16, 2008, from Virginia Assistive Technology System. (1998). Assistive technology in the student's individualized education program: A handbook for parents and school personnel. 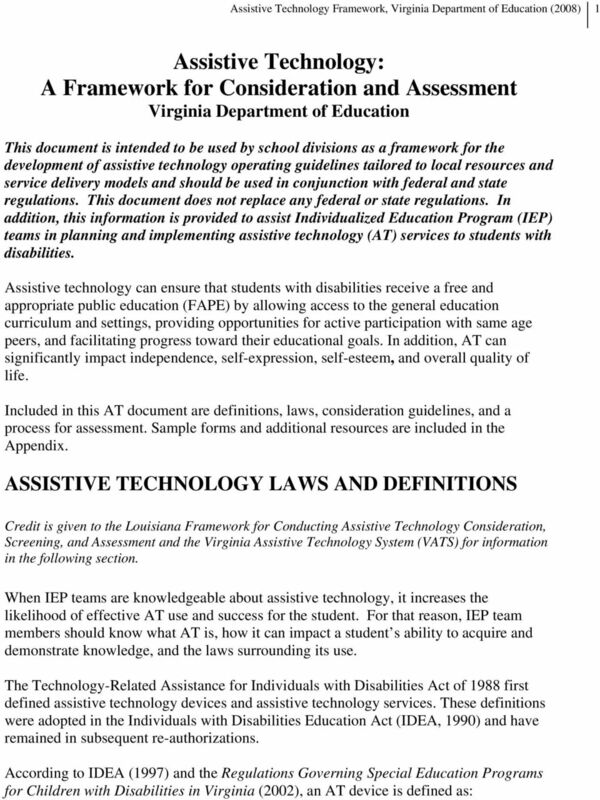 Richmond, VA: Virginia Assistive Technology System. Retrieved May 10, (2003). 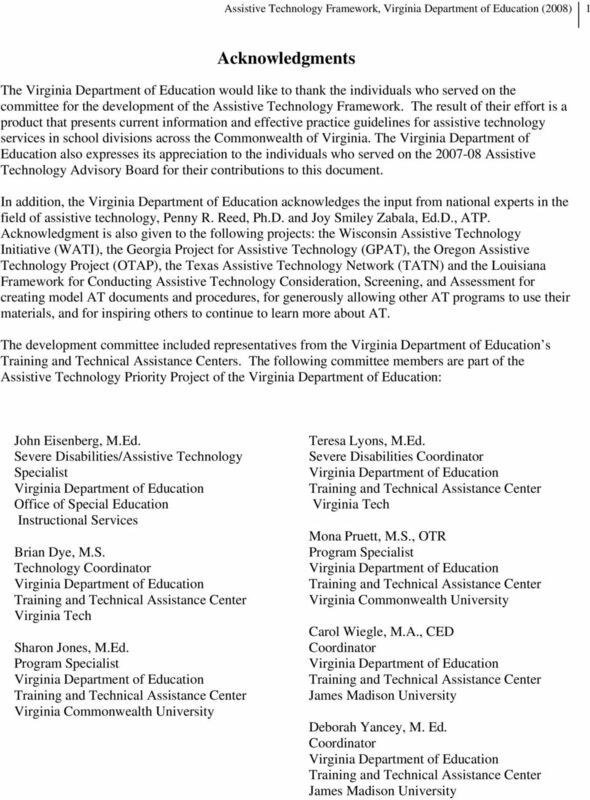 Educational technology plan for Virginia Richmond, VA:. Adapting Curriculum Navigating the College Transition Maze: A Guide for Students With Learning Disabilities Joseph W. Madaus TEACHING Exceptional Children, Vol. 37, No. 3, pp. 32-37. Copyright 2005 CEC.